I can still see him shuffling his way down the hall to my exam room. Tom (not his real name) was certainly eccentric. Long graying hair that was rarely combed properly. A large belly protruding from an old faded button-down shirt detailing his previous meals for everyone to see. And the stories he would tell! Tom was a retired engineer and he would regale me with tales of running computer lines between floors of buildings in New York City in the early 60’s, back when computers took up an entire floor. He would try, using what engineering senses he maintained after his retirement, to keep up on today’s exploding technologies – iPhones and bluetooth and 3D printing and such – but always seeming one step behind the “lingo”. And don’t let me forget the treasures Tom would bring to his appointments! Tom purchased our Surflink television streamer, which allows patients to hear TV audio directly in their hearing aids. Tom had mentioned that he didn’t think it was working very well, so to the subsequent appointment he brought the streamer, the cables that go along with it…and a shoebox overflowing with old wires, connectors and circuit boxes! Most of the stuff in there probably hadn’t worked in thirty years! “Do ya think any of these would work better?” Tom asked sincerely. Then there was the honey jar. Tom wanted an easy way to keep all his hearing aid supplies in one place, but couldn’t find a suitable case. So he found an old plastic jug that once held five pounds of honey from a farm in Amsterdam, NY. 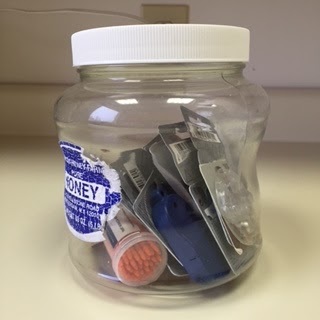 In that container went Tom’s hearing aids, batteries – both alive and dead, a battery tester, several bottles of ear oil, and various tools to clean his hearing aids – including a child’s Strawberry Shortcake toothbrush! To everyone else, that honey jar – like the box of electrical parts – is just a bunch of junk. To Tom, it’s a lifeline and the most logical way to care for things because, well, you just never know, do you? I know Tom often made appointments with me, not because he was having problems with his hearing aids, but because he was lonely. He would go to his bowling league and then come to my office for a chat. Sometimes his visits were inconvenient – like when I was packed up and ready to leave after a tiring day and I would hear that shuffling coming down the hallway. But I always tried to leave Tom with a smile and a little companionship and he always seemed to appreciate the efforts I made. At first, I was going to harvest out the hearing aid and chuck the jar and all its “treasures”. But then I stopped. And I remembered. The shuffling noise. The clothes. The hair. The wires going in every direction. I remembered Tom. He wasn’t just a patient of mine or another person who bought hearing aids from me. He was a PERSON. A person with a story. He had value, even if the world had written him off as an eccentric, weird old man. I’m going to miss Tom. And I’m going to keep Tom’s honey jar right on my desk. It’ll be there to remind me that, in an age where companies are turning hearing aids in commodities and products to be sold for the cheapest buck possible, we in hearing health care have a much more valuable commodity in our offices – our patients. Their lives mean something. Better hearing is the way with which we’ve been charged to improve these lives. It isn’t easy, and many of those we’ll be asked to serve will be difficult. Like Tom. But if we can bring help and hope to those who need it, we will have done some good. That’s our mission at Hear For You – Improved lives through improved hearing. It was my mission in serving Tom and it’s the goal for all of our practitioners with all of our patients. I hope we may get the chance to serve you this way as well.